Wrapping around your head how you will count your carbs and stay on track this Thanksgiving? Look no further, our healthy swaps guide, Thanksgiving edition, is here just in time for the holidays. Get inspired with these delightful fall favorites with a creative, low-carb twist! You may have made the switch to turkey burgers – or tried to and they just didn’t cut it – but beyond that, the only time your family talks turkey is in the deli line and around the table at Thanksgiving. But if you are diligent about your diet, and trying to mediate your already increased risk of heart disease by working hard to limit your intake of saturated fat, turkey can probably play a bigger role in your kitchen. A 4-ounce turkey patty contains 2.8 grams of saturated fat, 22.4 grams of protein, and 193 calories. The same amount of 75-percent lean ground beef contains 6 grams of saturated fat, 29.6 grams of protein, and 310 calories. These numbers may be no surprise to you, but did you know what a healthy and delicious stand-in ground turkey can be? So, if you’ve all but given up burgers, chili, meatloaf, tacos and burritos, Bolognese sauce, and meatballs, it may be time to try the turkey version. With a good recipe or simply the right, quality seasonings, you won’t miss the beef for a second. If you do go with traditional turkey this year for Thanksgiving, we have a great idea for leftovers. You’ve probably heard about the trick of rolling sliced lunch meats and cheese inside a lettuce leaf, and these little roll-ups do make for quick and tasty snacks. Also, large, dark green or red lettuce leaves are a great substitute for a burrito-size, white flour tortilla –– which delivers about 60, nutritionally empty grams of carbohydrate. Another option is choosing a low carb tortilla (or wrap), which will likely be made with soy or whole grain flour. You can take your wrap one step further on the health meter while also making something a bit more substantial, by doing more than rolling up a few slices of turkey. Lunch meats are notoriously high in sodium, and they also contain nitrites or nitrates, preservatives that are potentially carcinogenic. Brown ground turkey (antibiotic- and growth-hormone free if you can get it) in a saute pan with some olive oil and spices. You can simply use a dash of salt and pepper or sprinkle on the chili powder and a little cayenne if you like a bit of fire. 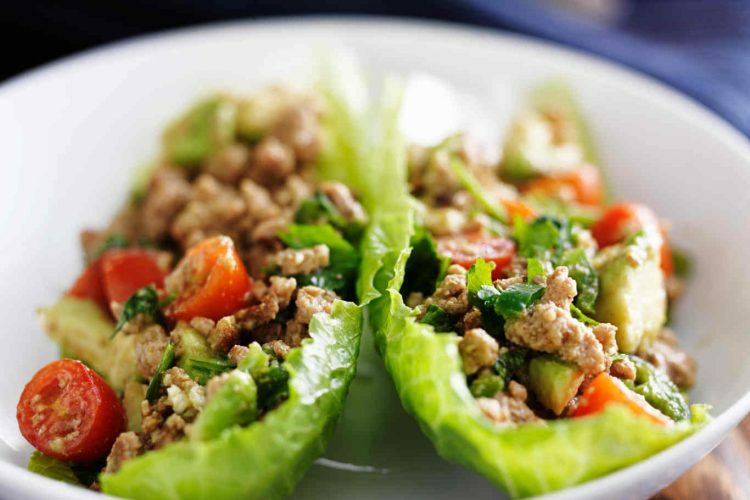 Spoon your seasoned turkey onto your lettuce leaves or low carb wrap, add shredded cheese, diced tomatoes, and avocado chunks. Roll it up and enjoy. 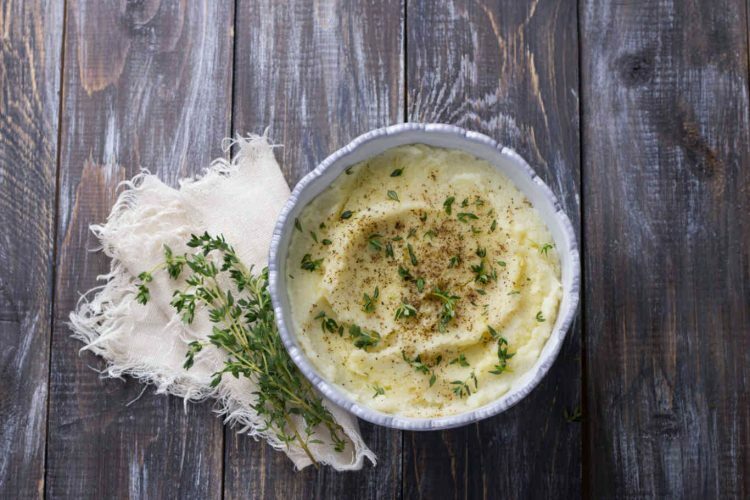 To have comforting, creamy, mashed potatoes without chalking up 35 grams of carbs in a one-cup serving, try this half and half strategy. Use half the amount of potatoes you want for your dish. A medium potato contains about 33 grams of carbs and 3 grams of fiber per cup. Then use an equal amount of either turnips (about 8 grams of carbs and 3 grams of fiber per cup), rutabaga (about 15 grams of carbs and 3 grams of fiber per cup), cauliflower (about 3 grams of carbs and 2 grams of fiber per cup) or some combination of the three. Boil or microwave the potatoes and vegetables, and mash these up together. Add a mixture of one-half softened butter and one-half healthy, trans-free, vegetable oil spread. Then, warm some cream or half-and-half in the microwave, and beat in until smooth. Salt and pepper to taste. For extra flavor, add minced garlic (raw or gently cooked) to the butter mixture, or mix in some grated parmesan, romano, or asiago cheese. Are you stuck in a morning toast rut? With diabetes, your options for morning toast may seem limited to trans-fat free margarine or dicey, low-carb or reduced-sugar jams. Consider whipping up your own apple spread. The good thing about apples is that no matter where you live, they are available year-round in your supermarket. And they are loaded with antioxidants and fiber. The scientific research on apples has shot this modest fruit into the spotlight. 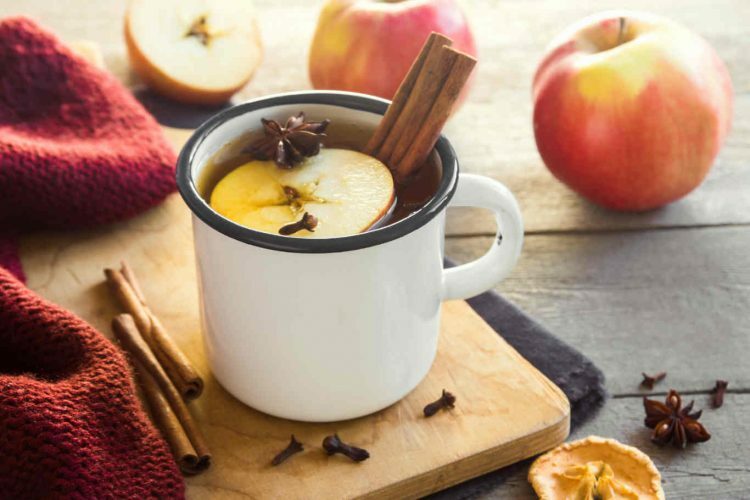 Recent findings have shown that the compounds in apples may reduce cholesterol, improve the health of arteries, reduce the risk of several types of cancer, and even reduce age-related damage to brain cells. To get the most of apples’ health punch, you need to eat the skin, because quercetin –– a star antioxidant –– is only found there. 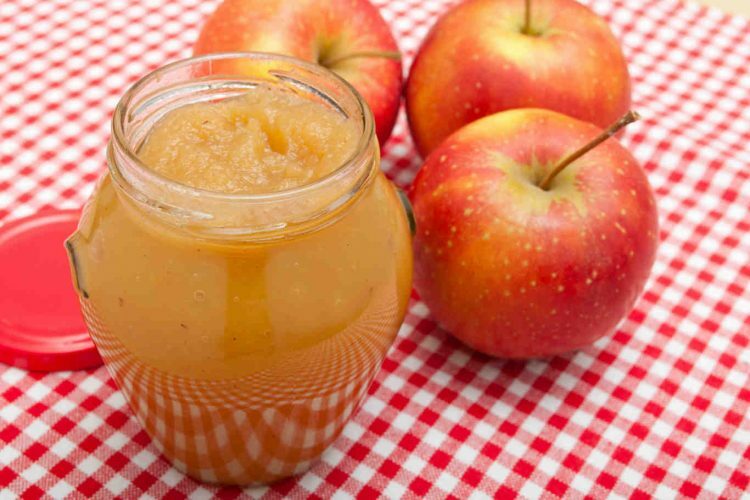 To make apple spread, core and chop up enough apples (choose very sweet and crisp varieties, such as McIntosh, Jonagold, and Fuji) to almost fill your largest pot. Cook them in about an inch of water or apple cider until uniformly soft. Puree in food processor and return to pot. Add cinnamon, cloves, ginger, and allspice. Bring mixture to a boil, reduce heat, and simmer until thickened. Your spread should keep for up to two months refrigerated in an airtight container. And, what should you out that delicious apple spread that you just made? Be adventurous, and try something new this week: Buy some sprouted bread. Why? They can be more nutrient-packed and have less impact on blood sugar than regular bread. 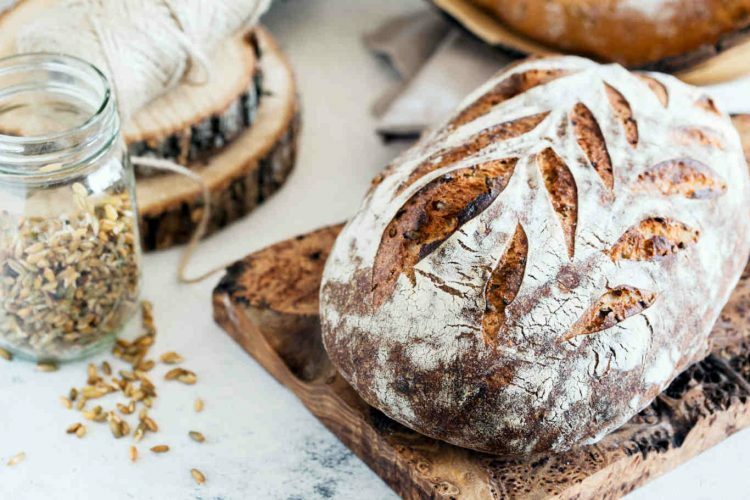 Formerly found only in the refrigerated sections of little health food stores, bread made from sprouted grains are increasing in popularity and availability. Traditional bread is made from grains –– usually, little hard kernels –– that are ground up and made into flour. Sprouted bread is made from grains that have been allowed to sprout before being ground. Once it sprouts, the grain contains a greater array of nutrients, and it may even decrease a bit in carbohydrates and glycemic impact. Jennie Brand-Miller and her colleagues, co-authors of The New Glucose Revolution and What Makes My Blood Glucose Go Up and Down? theorize that when a grain begins to sprout, it is likely that it uses its most readily available carbohydrate to fuel the actual growing of the tiny shoot. The result would be fewer carbohydrates left after sprouting. Virtually any grain that can be made into flour can be sprouted first, so browse the selection in your natural foods store and start experimenting. You may find you love the crunch of one or the tangy, nutty flavor of another. 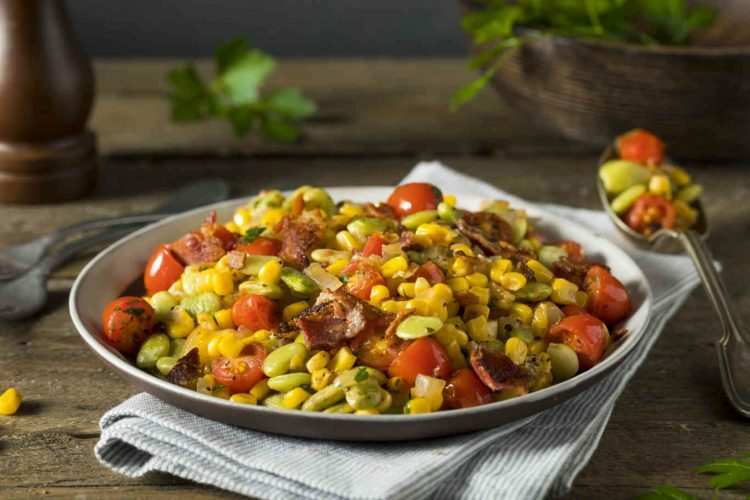 A word made famous by Sylvester the Cat, succotash is a traditional, American side dish made of lima beans and corn kernels. Sweet, buttery, and easy on the mouth, it’s a high-fiber comfort food, but can be made more diabetes-friendly with some substitutions. Lima beans have a relatively low glycemic index value (32, and under 55 is considered low), and a half-cup (of frozen baby limas) contains 18 grams of carbohydrate, 5 grams of fiber, and 6 grams of protein. A perfect stand-in for limas, however, is the green soybean known as edamame. Generally available frozen, shelled or in the pod, these beans are very similar to lima beans, but a half-cup contains 10 grams of carbs, 4 grams of fiber, 11 grams of protein, and are an excellent supply of vitamin C, calcium, and iron. Green soybeans also contain all the amino acids needed to make a complete protein, and all of this means they are a very decent substitute for meat. Instead of corn in your succotash, use diced, sauteed winter squash and yellow pepper. You’ll end up with a delicious side dish that looks just like succotash, with the same sweet and buttery flavors and textures, but a lot less impact on your sugar. It’s a general rule of thumb, straight from the dietitians: Eating foods in their whole state, rather than mashed, pureed, juiced, etc., generally lessens the impact on blood sugar. For example, choose a baked potato over mashed, choose a whole apple over applesauce, and always choose the whole vegetable or the whole fruit rather than juicing it, so that you get all the beneficial fiber (which, don’t forget, cancels out some of those carbs) and the other nutrients stored in the skins and pulp. An excellent illustration can be found in an orange. When you drink orange juice, you get the vitamin C but not the beneficial fiber and phytonutrients that come from the pulp. Even if you buy orange juice with pulp, you’re still not getting any of the fibrous white membrane, which is where the phytonutrients hide. Nutrition science research is finding, increasingly, that it is not one substance or another that gives plant foods their disease-fighting power, but the interaction of these vitamins, antioxidants, and other plant chemicals. So, eat things the way Mother Nature presents them, and you won’t miss out on any hidden health benefits. When it’s cold outside, sometimes there’s nothing better than a steaming crock of chowder, bisque, or any creamy, rich soup. Cream-style corn and corn chowder are right up there with mashed potatoes when it comes to winter comfort foods. However, on the health meter and in terms of glycemic impact, many of these comforting choices rank pretty low. A somewhat old-fashioned, off-the-beaten-track, healthy alternative? Split Pea. 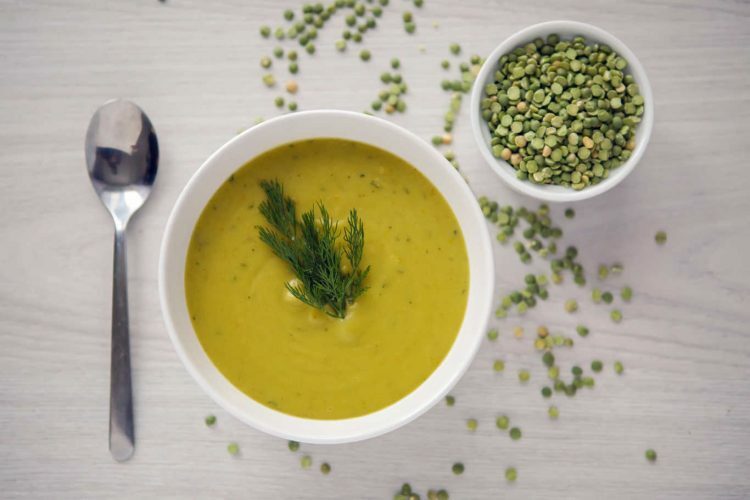 Split peas are relatively low in carbohydrates and have a lower glycemic index than some other legumes, and because they are quick cooking and have the consistency of some favorite American comfort foods, split pea soup makes for a great meal on a chilly day. Add 2 quarts of cold water to 2 ¼ cups of well-rinsed split peas. Let soak overnight, or just simmer for 2 minutes and soak for an hour. Then, bring to a boil, turn down the heat, and simmer covered for about an hour and a half. Add seasonings (salt, fresh pepper, nutmeg) and diced vegetables, such as onion, celery, carrots, leeks, and cook uncovered until veggies are tender. Cauliflower is a great substitute for white noodles and white rice, because of its color, versatile texture, and because cauliflower is a member of that ultra-healthy family of cruciferous veggies. People who consume the most of these types of vegetables (cauliflower, broccoli, cabbage, Brussels sprouts, bok choy, and kale) have lower rates of several kinds of cancer, and laboratory tests have shown that certain compounds in cruciferous vegetables actually stop the growth of many types of cancer cells. One way to use cauliflower is to steam or boil it, chop it roughly, and then substitute it for half the macaroni in your favorite reduced-fat mac and cheese recipe. 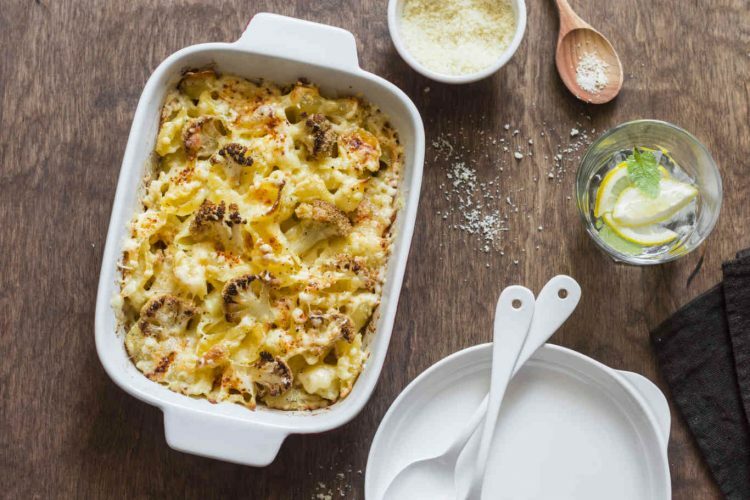 Another option is to make a roasted cauliflower casserole, leaving out the pasta all together. Chop cauliflower into chunks, and arrange in a baking dish. Add two to three cloves of garlic, minced. Drizzle with olive oil, and squeeze a lemon over the pieces. Season with salt and pepper. Bake in a 400-degree F oven for 20 minutes or until the tops are browned. Remove and sprinkle generously with grated parmesan. There are more types of tea on the market today than anyone could ever count. And they’re full of health benefits – think antioxidant, anti-cancer, anti-inflammatory, to name a few. So why not experiment with herbal, black, green, and white teas (Tazo makes some delicious blends), and find your favorites? Once you do, brew up a pot, let it cool and keep it in your fridge so you can grab a healthy “soft” drink any time you want.